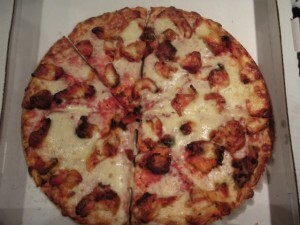 Chicken Tikka Pizza recipe by Maryam Burki at DesiRecipes.com. Mix the yeast and sugar in water then let it rest for half an hour. Add the flour and oil knead well and let it rest till it doubles in size after that punch out the air with the palm of your hand and roll it on floured surface and add on oiled 12 inch pizza dish and prick with the fork then spread the pizza sauce on it. In a frying pan saute the tikka chunks and all the other filling ingredients for 5 minutes take it out and spread evenly on the pizza base sprinkle the cheese on top and bake for 15 to 20 minutes till cheese gets crispy light brown. this pizza so good is not looking but recipe is good i will try!! IT IS THE AWESOME PIZZA I EVER HAD!!!!!!!!!!!!!!!!! really nice!its greaT! very easy and simple.